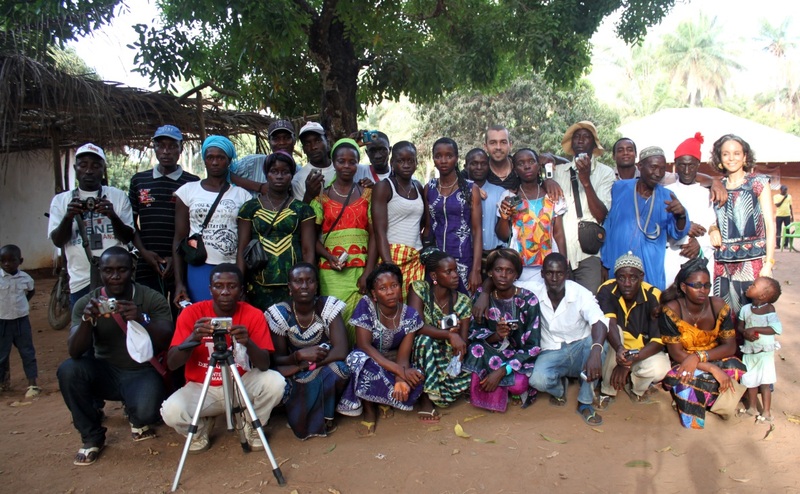 Farmers from southern Guinea-Bissau acting as researchers and photographers was the methodological premise of a collaborative research project led by Joana Roque de Pinho, a postdoctoral researcher at CEI-IUL. This project resulted in a photo exhibit recently held at Osaka University’s School of Foreign Studies, in Japan. Organized in collaboration with the Graduate School of Language and Culture at Osaka University and the Minoh City Office, this photo exhibit is a visual ethnographic output of an FCT-funded research project entitled “Impacts of Climate Change and Conservation: A Study with Participatory Photography in Cantanhez National Park, Guinea-Bissau” (EXPL/IVC-ANT/1709/2012). At the time of this research, Joana was with the Center for Administration and Public Policies (CAPP) at the Instituto Superior de Ciências Sociais e Políticas. The research goals included an exploratory investigation of rice farmers’ perceptions and knowledge of local climatic changes. However, in keeping with the philosophy of participatory research methodology, the project’s research collaborators, all living in the village of Cafal in Cantanhez National Park and using cameras that remained with them after the project ended, created images and shared stories about those images that actually addressed broader ecological, social and cultural changes inside this protected area. In so doing, they offered detailed and multi-layered insights into livelihood concerns and environmental changes from their local perspectives – which sometimes clash with predominant notions about local environments and social-ecological relationships shared in NGO and scientific literatures. This project’s traveling photo exhibit was co-curated by the local farmers-photographers, who both selected the majority of the photos they wanted to share and created the accompanying narratives. The Cafal photographers, true co-authors of this work, men and women from 25 to 75 years of age, are Manuel Camará, Manuel Tchuda, Luís Paulo Cabral, Jóia Gastão, Sene Cassamá, Haruna Cassamá, Mussa Cassamá, Mariama Cassamá, Satan Turé, Umo Cassamá, Banna Seidi, Binto Turé, Mariama Nabrimpande, Albat Ialá, Bebé Naman, Papis Demba Camará, Zeca Dju, Pedro Nancussa, Roberta M’boto, Joana Natumna, Mussa Conté, Umaro Finhane Nanao, Lissa Turé, Bulutna Nancussa, Sene Bangura, Paulo Nanfuta and Fina Giraldo Dias. The exhibit at Osaka University, entitled “Voices of Cantanhez,” was held on Minoh Campus, opening to the public during the 37th Osaka University’s Summer Festival on July 9th, and running through August 11th, 2016. It benefitted from the coordination of the Luso-Brazilian Studies Department and logistic support of the School of Foreign Studies. All the photograph’s legends were translated from Portuguese to Japanese by Luso-Brazilian Studies’ professors and third year students. This exhibit was also useful as a teaching tool, exposing Japanese students from a range of Languages and Culture undergraduate and graduate degrees to livelihoods in an African Lusophone country, Guinea-Bissau, and provoking them into thinking and writing critically about issues of representation of the African continent. A book resulting from this collaboration with the University of Osaka is in preparation, coordinated by Joana Roque de Pinho and Rena Torii (Osaka University School of Foreign Studies). Meanwhile, you can find out more about this research project’s results in this publication: Roque de Pinho, J. 2016. Portraits of Change by Farmers in Southern Guinea-Bissau. Visual Ethnography 5(1).